On January 13, 2019, at HLUMC, we witnessed baptisms, reaffirmations of faith, the receiving of members and prayers for renewal… and celebrated the beginning of our Confirmation class. I saw: a man and his son, kneeling together—one being baptized, the other reaffirming his faith; another man and his two daughters, and yet another man and his daughter and son—all of them being baptized. We took in families, and individuals; black and white; rich and not so rich; (really) young and not so young. We received entirely new believers and some who were renewing faith. 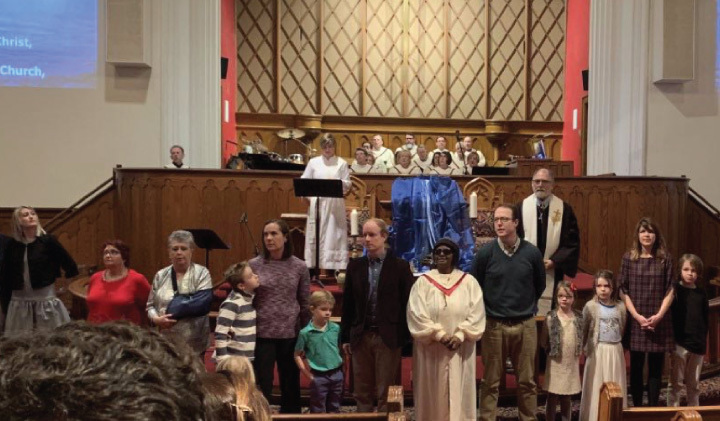 We welcomed people from other traditions: Baptist, Catholic, Presbyterian; and while we recognize and affirm the value of those traditions and experiences, we are so glad God has led those people to us. Twenty-seven new members, and it was an amazing morning. Yes, he is right. Which makes the miracle all the more amazing! And what a blessing, to believe that Jesus is with us in our baptismal waters, as he was one day long ago. No coincidence that January 13 was, according to the Christian calendar, Baptism of the Lord, which reminds us of one of the great stories in the New Testament. Our worship theme for the year is ancestry.faith. We are looking at the great stories and characters of scripture that provide us our spiritual DNA. The seasons of the Christian calendar can help us explore our ancestry. They set a context for Jesus’ invitation to join him in his work. In sum, the church calendar tells the story of Jesus’ life, narrates some of the most important episodes in his ministry, and in that way help us to find our way into his way. We are invited to align our lives with his life and to find our purpose in the story of God’s way with the world. So far: Advent: the four weeks prior to Christmas day, when God’s promises gestate. We remember Jesus in Mary’s womb. We await his birth, and the appearing and experience of God’s salvation and joy. Joy, says Eugene Peterson, is always a communal matter, never something we feel in isolation from brothers and sisters. Joy comes to us, to or church, to the world, to all people, as we experience and ponder the grace and mercy of God. The first Sunday of Advent is the Christian Calendar’s New Year’s Day. After Advent comes Christmas—which is both a Day and a Season. On December 25, we sing in celebration of the Light born into the darkness. Sadly, most of us quit celebrating “grace” far too soon—in favor of resolutions and work (the secular New Year falls on the 8 th day of Christmas)—which cannot save us. It is an irony how, so quickly after beginning with the Spirit, we end with the flesh. Jesus; and how Herod brought the sword and the shedding of innocent blood. If Christmas tells us that Jesus was born king of the Jews, Epiphany reminds us that Jesus is also Savior of the world. The Magi were but the first non- Jews to recognize the significance of Jesus’ coming. Herod was but the first narcissistic madman to violently oppose him and his proclamation of peace. The season of Epiphany tells some of the many ways in which Jesus’ ministry as Savior of the world is recognized by those he came to seek and save. On the second Sunday of the season of Epiphany, every year, we tell the story of Jesus’ baptism. We remember how Jesus came from Nazareth, 90 miles to the north, on foot; how he found his cousin John in the wilderness, and the crowds who flocked to him. John was preaching hellfire, damnation and warning the crowds of the coming judgment of God. John demanded not just contrition but conversion, and real, good works, as evidence of that conversion. And John offered baptism to those who were confessed, repented, and desired a new life and purpose. Curiously, Jesus—who did not himself need what John the Baptist was offering—came to the river to take his place with those who did. Jesus took his place with them, and with us—he really is Emmanuel—so that that we can take our place with him, and with others. He still does. We saw that on Sunday! And nothing like I have ever seen before! What a great, unique, unparalleled day we enjoyed. En-JOY-ed. Our entire community, blessed by the day. If I didn’t know better, I would say that Sunday was Pentecost rather than Baptism of the Lord… what a great time. I am glad for the many who were there, and somewhat sorry for those who weren’t. But you can still see it (go to our “Worship With Us” tab, click on “Live Streaming,” and watch the service from January 13).